Dr Penny Edrich discusses tick-borne diseases and how to remove a tick. 'Do we remove ticks here?' asked the receptionist as I walked in. As duty doctor, my answer could only be 'yes', but despite living and working in proximity to the Mendip Hills, I had never had occasion to actually remove a tick. A quick scan of the literature, including Health Protection Agency (HPA) advice about tick-borne diseases, and a handy YouTube clip, ensured I was prepared for the tick when it arrived a few minutes later, clamped to the arm of a teenage Venture Scout. Confidence and a pair of toothed forceps are the keys to removal, I discovered. It is helpful to have a dermatoscope, or even ophthalmoscope, to view the tick and ensure there are no remnants left behind. The larvae only have six legs, but the nymphs and adults have eight legs. Ticks are tiny blood-sucking arthropods that resemble small spiders or mites. The deer or sheep tick is the one most often found on humans. They are often found in woodland, heathland and grasslands, and can also be present in urban/suburban parks and gardens. Although they are present all year round, they are most likely to bite from February to September. They may be present on their host animal, including humans, for several hours before feeding. To feed, they bite into the animal to attach themselves to the skin. They then feed on blood from the host and after five to seven days, they drop off when full. The tick's saliva carries a natural anaesthetic, so the bite may not be noticed at first. Initially, ticks are so small they can be mistaken for a speck of dirt or a freckle. After feeding, adult ticks can be the size of a small pea and become lighter in colour. Globally, ticks are one of the most important disease vectors, second only to mosquitoes. In the UK, they are important vectors of Lyme borreliosis. After feeding on an infected host, a tick can become infected and consequently transmit this infection to any subsequent hosts it may feed on. Tick populations are found in many areas of the UK, but only a minority of ticks in any area are infected with Borrelia burgdorferi. As a precautionary measure, any tick should be regarded as potentially carrying infection, but the actual risk will vary from area to area. 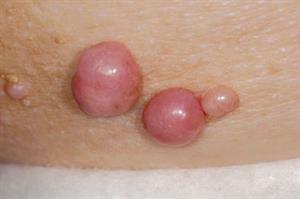 Patients should be advised to look for a rash within a few weeks after removal, but reassured that they are not at high risk. Patient advice sheets are available to download from the HPA (www.hpa.org.uk), as well as advice for health professionals. Lyme disease is the most common tick-borne infectious disease in Europe and North America. It can affect skin and joints, as well as the heart and nervous system. According to Public Health England, in 2012, the number of provisional cases in England and Wales was 998. However, because cases may not be confirmed by laboratory tests, estimates suggest there are 2,000-3,000 cases of Lyme disease in England and Wales every year. 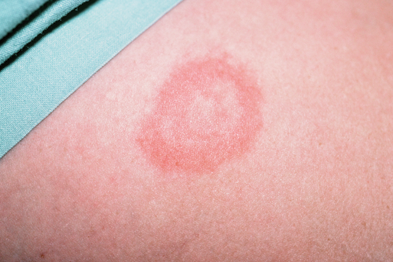 Early on, a rash resembling a bull's eye may appear in 70% of cases and flu-like symptoms may also occur. The classic erythema migrans rash is diagnostic of Lyme disease and should be treated with antibiotics. Lyme disease can be arbitrarily divided into early manifestations, which include a typical rash (erythema migrans), acute neuroborreliosis or Lyme carditis. If untreated with antibiotics, more serious complications, such as nerve damage or arthritis, can occur months or years later. Late manifestations include arthritis, acrodermatitis and some rare manifestations of neurological disease. In the UK, the rash may be absent in up to 30% of patients who will present with neurological signs or arthralgia. A patient presenting with Bell's palsy, unexplained radiculitis or arthritis and a history of possible exposure should be tested for Lyme disease. Lyme disease is usually diagnosed by serology. Antibodies may not be detectable in the first few weeks after infection, because an antibody response takes several weeks to develop, so a negative test at this stage of infection does not exclude a diagnosis of Lyme borreliosis. A second sample taken two to four weeks later may be required to show seroconversion. The chances of a positive test in early infection range from about 30% in the first two weeks to about 80% by six weeks. Patients with late-stage Lyme disease are very rarely seronegative; there is a >99% chance that they will have a positive antibody response. PCR is also available and may be useful in testing joint fluid and biopsies of rashes. This has poor sensitivity on CSF and antibody detection is the preferred first-line test on CSF. In general, the oral antibiotics doxycycline, amoxicillin or cefuroxime are recommended for two weeks (range 10-21 days) for erythema migrans and isolated facial palsy, and four weeks when treating patients with Lyme arthritis. Consultation with a local microbiologist or the HPA unit is prudent to obtain current dosage advice and discuss investigations and further management. Dr Edrich is a GP in north Somerset.